Picking a school is like picking out the perfect pair of socks. Actually, I take that back. It’s nothing like picking out a pair of socks. You don’t need to endure years of financial planning, research, and understanding of what goes into the making of a good pair of socks in order to pull the trigger and make a purchase. At most, you’ll need a keen sense of style, and at least just something that covers a majority of the foot. After all, who cares if a couple toes poke out from the bottom? Schools are also not “one size fits all”. Many parents spend a lot of time and money on making sure their child attends an “elite” school, when this might not actually be the best option for the child. 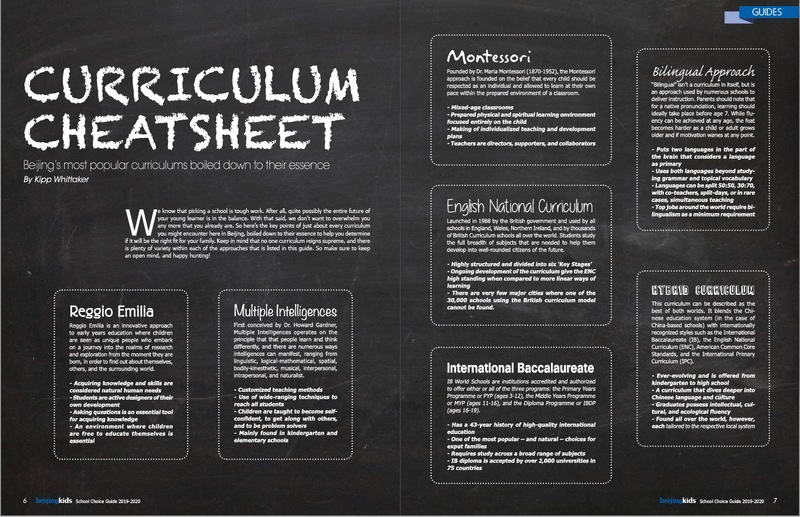 So, it’s important to know what kind of learner your child is, and which curriculum that will ultimately benefit this type of student. Neglecting these characteristics could be setting your child up for disaster. 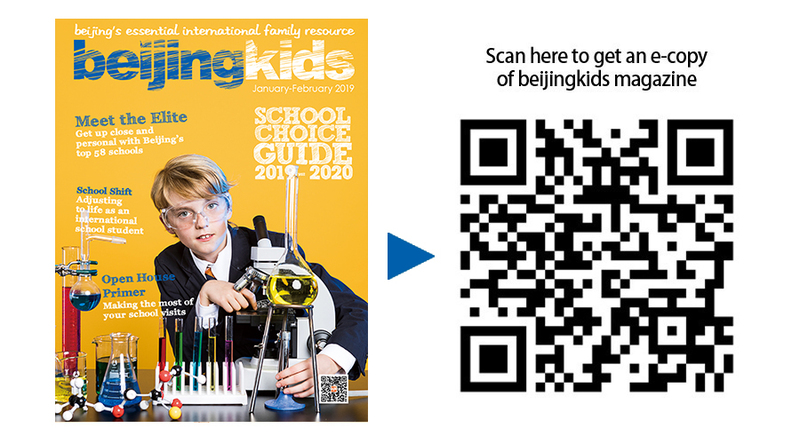 With every School Choice Guide that beijingkids produces, we hope to bring families closer together through this task of picking the right school. It’s not just about the difficult choices that are ahead of you, it’s also a chance to get to know your child, and what his or her interests are academically and socially. While superb academics always remain at the forefront of this journey, schools are much more than this, and in many ways can be your child’s main window on life and the community at large here in the capital. 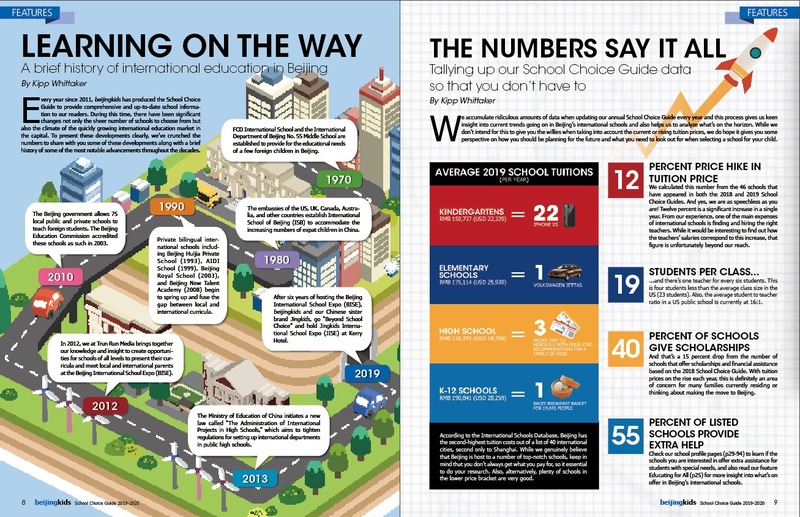 In this issue, we’ve examined a range of topics to help you make a more informed decision, including some straight talk from parents in Beijing’s expat community, telling us what they wish they’d known before selecting a school. 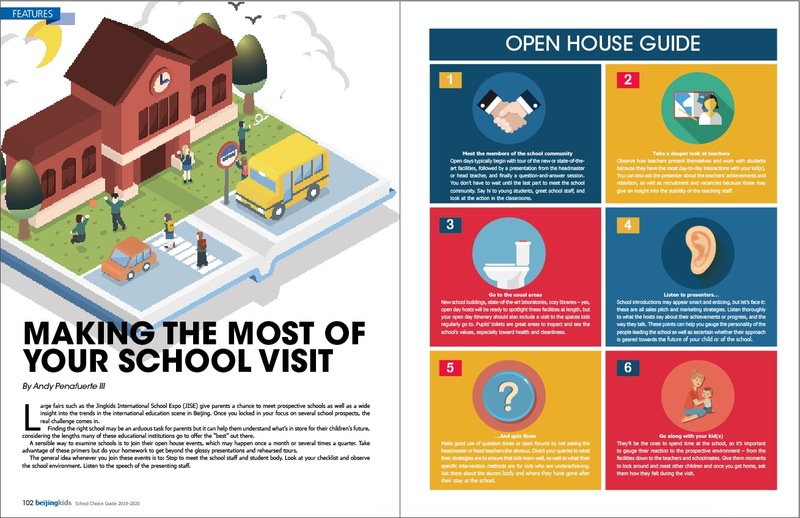 We’ve created a primer for those of you who will soon be attending open houses at campuses across Beijing, and talked to some parents who opted out of the school system and instead embarked on their own homeschooling journeys. For this School Choice Guide, we also wanted to go beyond your standard “what parents need to know” article, and find out what your child needs to know. In School Shift, former international school student Lydia Qu interviewed a handful of seasoned international students, to gather some helpful tips on how to adjust to a new environment. Also, in case you didn’t know already, the School Choice Guide is your essential resource for navigating our upcoming Jingkids International School Expo, a must-attend event not only for those of you who are pondering a change in schools, but also for anyone that wishes to stay up-to-date on the future trends of education, and how curricula are being adjusted to help prepare young people for a future filled with uncertainties. Get over to beijing-kids.com to learn more. We hope to help make this journey of school choice a little bit less daunting. We know that this issue is limited, in that there is no perfect formula for finding the right school for your child… yet. (We are working on it.) Until that comes along, here is the most comprehensive guide to school choice that Beijing has to offer.